Our company rankings just got more interesting. Last year, we gave you the world’s Most InDemand Employers, along with sub-lists for specific countries and functions. Now we’re taking our insights down to the city level and just today at Connect in New York, we announced the Big Apple’s rankings. So where do New Yorkers most want to work? Based on LinkedIn’s massive data set - and the actual actions of over five million professionals residing in the New York area* – here’s a snapshot of the city’s professional landscape and its most desirable employers. Did your company make the list? Google’s #1 spot hints at the city’s booming tech industry, but it is still the sole internet company on the list. Health & Pharma companies are the most well-represented, with five industry giants in the top 20: Johnson & Johnson, Pfizer, Bristol-Myers Squibb, Merck, and Novartis. Media is also well represented, with Conde Nast, Viacom, NBC Universal, and ESPN the most attractive to potential candidates. In the fashion/retail space, larger shops Ralph Lauren and Coach make the list, as does the more petite outfit J. Crew. Among the myriad finance and consulting firms, Goldman Sachs, McKinsey & Company, and JPMorgan Chase make the cut. Despite New York’s reputation as the advertising capital of the world, Ogilvy & Mather is the only ad agency in the top 20. The remaining winners are big names with strong consumer brands: Apple, L’Oreal, and PepsiCo. Large companies dominate: over 75% of the companies employ more than 10,000 people, but smaller ones still manage to compete. Headquarters matter: the majority of companies are headquartered in New York while only a quarter of them are based elsewhere. There’s some overlap with the Global Top 20: Google, Apple, PepsiCo, McKinsey & Company, and Ogilvy are the five companies that make both lists, with Google taking the top spot in each. Working for a sought-after company has a certain cachet. It feels good. It makes you more satisfied and productive. It makes you less likely to leave. And then when you do want to leave, it makes you a more desirable candidate. 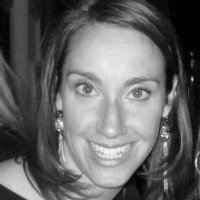 For the companies themselves, it’s simple: a good reputation makes recruiting easier, cheaper, and faster, while a bad one does the opposite. That’s why we developed the LinkedIn Talent Brand Index, a powerful tool to help employers measure and improve their talent brand. *How did we rank the winners? We analyzed billions of data points between members and companies and compared them to thousands of survey responses to determine a company’s familiarity and engagement score. 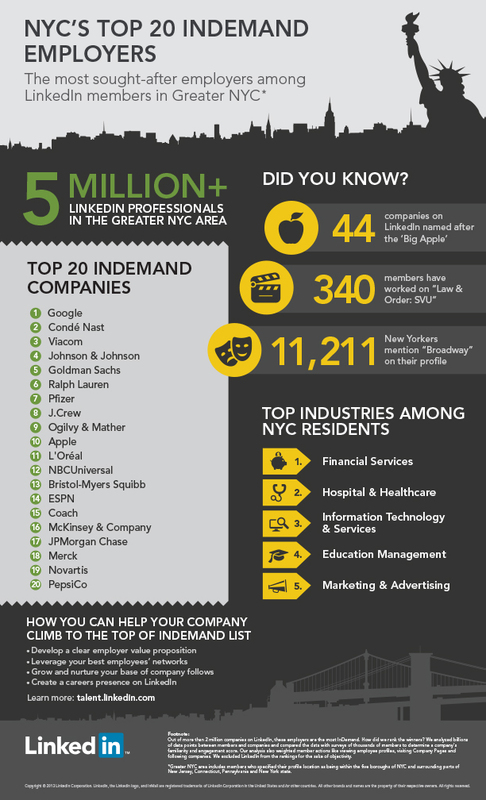 The 5 million+ New York City member actions were factored in, including connecting with employees, viewing employee profiles, visiting Company and Career Pages, and following companies. We then analyzed the same activity for just the five million members residing in the Greater New York area. We excluded LinkedIn from all rankings for the sake of objectivity. Note: This post originally appeared on our LinkedIn Talent Solutions blog.